When you walk into Dripworks, there ‘s a certain je ne sais quoi one may not expect in Petoskey, but after coast to coast moves from Seattle to Vermont, owners Danielle and Mike decided to return home - well, after a short grad school stop in England – and they brought a “selfish desire” for “really good coffee and baked goods” with them. While she and assistant, Dalton, perform their magic behind the counter, I realize I’ve listened to classical music, country music, and now a little “Major Tom” from David Bowie. “We like to keep the music eclectic,” Danielle says. Eclectic would be an understatement. Everything from Hank Williams to Vivaldi, with a little George Winston in between soothes the ears without being too intrusive. Sprigs of winter greenery sit festooned next to water bottles at each table. Metal cups memorialize a rustic cabin feel and pastel, yellow metal stools accentuate the simple. People converse, people visit, and many walk in and out with their orders to-go. The coffee specialty is a pour-over utilizing single origin beans from selected roasters and regions of the world. With each serving, a card is provided describing the coffee and highlighting the region. The purchase for me this morning was from Carmen Estate located in El Salvador. 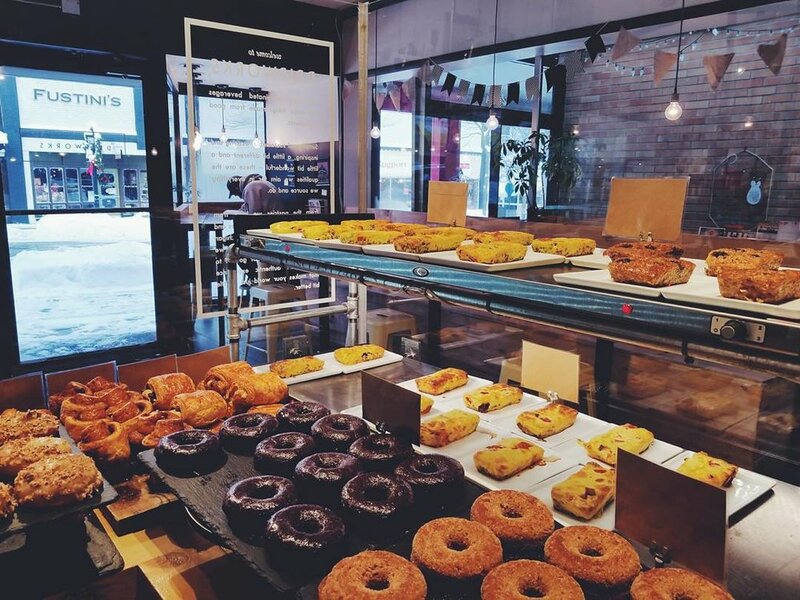 The baked goods are all original concoctions of owner Mike, made fresh daily. I experienced the baked oatmeal with blueberries and it was superb. The texture of the oatmeal remains soft during the baking, and the full flavor of the berries shines on throughout the loaf. Dripworks is located at 207 Howard Street between Lake and Bay Streets. There is street parking directly in front of the door and along all of the side streets. When you enter, note the music and take in the cozy before you sit, then ready yourself for a very unique coffee and bakery experience.